Description of "Weaving Magic - The Word Way! (eBook)"
Poetry is often the best language to express your emotions. Here is a small collection of 25 poems – the first of my four book series, written based on word prompts, which were originally published on my blog. Hope you enjoy reading them! An Engineer by profession. A Journalist by passion. Annapurani Vaidyanathan is your girl next door who believes in having her way through words. 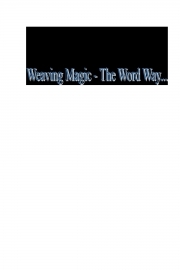 Reviews of "Weaving Magic - The Word Way! (eBook)"